Monterey County is known for having the longest growing season in the state due to the maritime influence of Monterey Bay and the unique geography of the Salinas Valley. This longer “hang time” (the time the fruit spends on the vine) allows the grapes to ripen slowly and evenly and achieve peak flavor development. 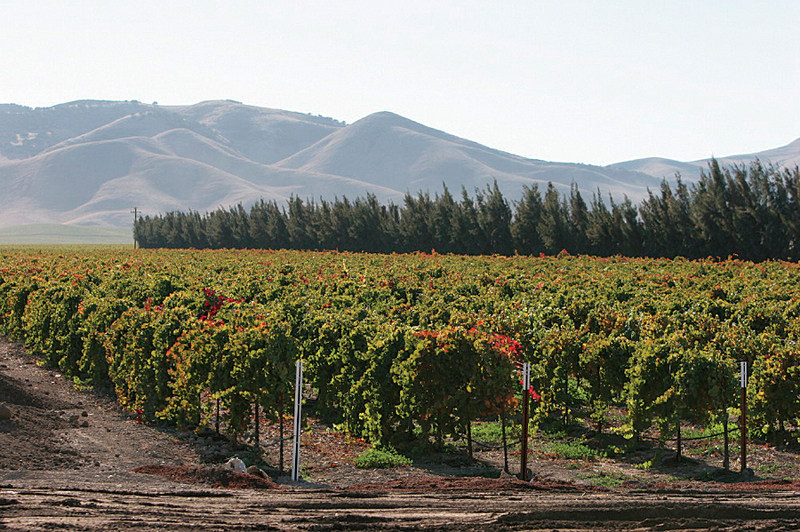 Scheid Vineyards, with 10 estate vineyards located along a 70-mile spread, is able to grow 29 different varieties in a spectrum of styles. Neutron probes have been installed throughout Scheid Vineyards to monitor the amount of moisture in the ground in a specified area. The information collected from each probe is added to the GIS so that all the data can be interpolated to create a raster map that represents soil moisture levels across the entire operation. 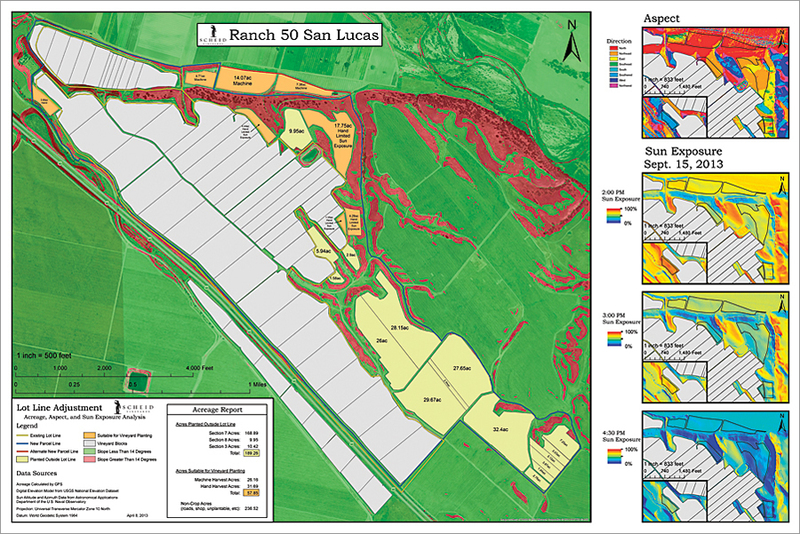 This soil moisture map then becomes another layer in the vineyard’s enterprise GIS. 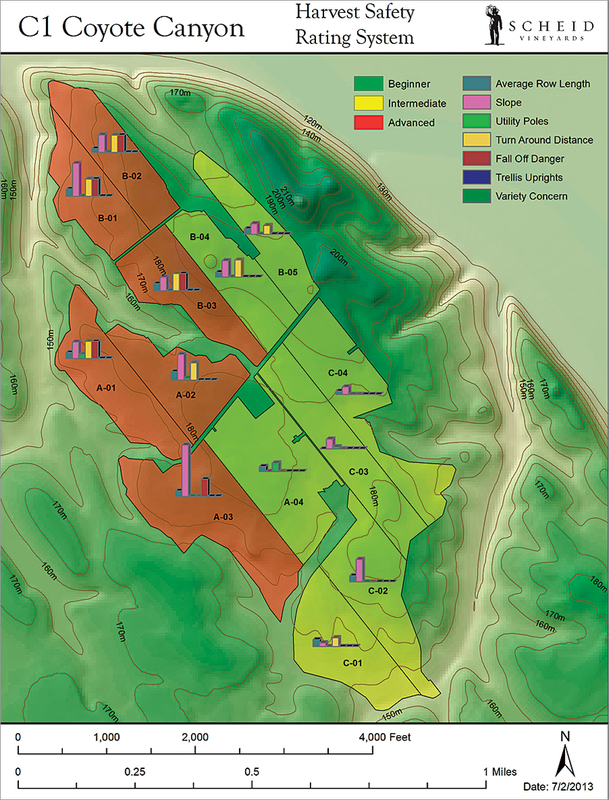 The map will be used as part of the vineyard’s irrigation geographic infrastructure, which is currently under development. The GIS/vineyard technology team is planning to integrate weather station and irrigation data with the soil moisture map and remote-sensing data so that it can become more dynamic and precise in the application and monitoring of its irrigation processes. GIS is also used to track the special treatment of some vines for Scheid’s Estate Row program. This program involves the careful monitoring of specific rows of vines within the vineyard that are cultivated differently than the others, depending on the winemaker’s needs. The treatment of these rows varies from year to year, and the winemakers carefully evaluate the quality of the wine produced after each harvest. The goal is to replicate an especially good wine by following the same procedures and treatments previously performed on a particular row. The collected data for the Estate Row program is maintained in the GIS so that it is accessible throughout the entire company for review.